In order to correct the GULO mutation, one would need to take more Vitamin C than is commonly recommended by medical and governmental authorities. Vitamin C is a panacea for many conditions due to the fact that humans evolved to require a great deal more Vitamin C than we can eat. Unlike our ancestors, we humans can no longer make Vitamin C in our bodies. All humans are born with a genetic defect. Our livers are missing a key enzyme, xl-gulono-§-lactone oxidase, which is required to synthesize ascorbic acid from glucose. The loss of this single gene prevents humans from making their own Vitamin C. The negative mutation of the so-called GULO gene has been well studied in both human and primate genomes. If this negative mutation could be corrected, most people would no longer need to supplement Vitamin C in their diets. Thanks to modern science, it is easy and inexpensive to correct this damaged gene by supplementing Vitamin C (ascorbic acid or one of its salts) into one’s diet. As with any inherited malfunction, the inability to produce the GULO enzyme has negative consequences. Most people are taught to believe that they can obtain enough Vitamin C in their food, and so they supplement too little. While this ‘food argument’ generally holds true for most other vitamins, the idea that one can obtain the necessary amount of Vitamin C in food sources is countered by facts. When compared to all of the species alive today, humans are nearly the only species with a GULO-like genetic defect. Most living things today make their own Vitamin C and do not have to obtain it through food sources. They do this by converting glucuronic acid (C6H10O7), derived from glucose (C6H12O6), into ascorbic acid (C6H8O6). The exceptions that cannot make their own Vitamin C are guinea pigs, fruit eating bats, the red-vented bulbul bird, and higher primates, such as gorillas and humans. With a working GULO gene, humans would make their own Vitamin C in “fantastic” amounts by today’s standards. In the 1930s, Dr. Claus W. Jungblut, an early pioneer of Vitamin C therapy, discovered that only primates and guinea pigs were susceptible to scurvy as well as anaphylactic shock, pulmonary tuberculosis, diptheritic intoxication, a poliomyelitis-like viral infection and a viral form of leukemia. However, none of the Vitamin C synthesizing laboratory animals had susceptibility to these diseases. Gorillas in captivity are susceptible to the aforementioned set of diseases, and humans share other conditions with these primates that are not common in other species (e.g., cardiovascular disease). Linus Pauling elucidated in his Unified Theory of Cardiovascular Disease paper, and in a video-taped lecture, that a large consequence of our genetic deficiency is our tendency to develop cardiovascular disease, which for many is a primary cause of death. If there is one thing to know about vitamin C, it is that animals make far more of it 24/7 than the U. S. Recommended 70 mg Dietary Allowance for human beings. Animals produce much more Vitamin C in their bodies than what humans can obtain from the meager dosages recommended. Adjusted for body weight and under ordinary conditions, animals have been found to produce between 3,000 to 13,000 mg of ascorbic acid daily. A goat under stress may produce over 100,000 mg of ascorbic acid daily. As these animals make their own ascorbic acid, the molecule enters the blood stream intact (directly from the liver or kidney). Ascorbate, another term now used for higher dosages of Vitamin C, is volatile and reacts easily with other substances. Because of this, some Vitamin C is lost when taken by mouth during the digestion process. Scientists have estimated that 50% or more of the Vitamin C taken by mouth may not reach the blood stream intact; therefore is not bio-available. This loss will increase as the dosage by mouth is increased. Linus Pauling, according to a biography, did not begin taking Vitamin C until his sixth decade of life. 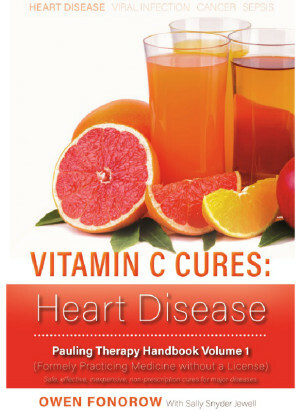 At the age when most retire, Pauling instead became a champion of Vitamin C.
During videotaped lecture during the 1980s on Vitamin C and Cancer, Pauling stated that his personal dosage was based on his body weight and the expected loss of ascorbate taken by mouth. Pauling wrote that his daily intake of ascorbic acid was 18,000 mg. Pauling determined through experimentation that at this dosage, he lost approximately 50% of the Vitamin C taken by mouth during digestion. Mammals of his body weight have evolved to make 9,000 mg of Vitamin C throughout a typical day. For this reason, he doubled the dosage an animal would produce (9000 mg) and consumed 18,000 mg daily in two divided dosages (i.e., 2 dosages of 9,000 mg twice daily). This daily dosage accounted for the loss, and approximated the blood and tissue concentrations of species that make their own ascorbate. Linus Pauling also learned that since Vitamin C has no known toxicity, there is little risk from this high of a dosage. Pauling’s last video lecture on heart disease, which he gave without notes at the age of 92, proved to many that his mind was still sharp and exceptional. Pauling lived to the extraordinary age of 93 years old. We may be at the onset of creating human life spans longer than 125 years! Linus Pauling anticipated that anti-aging science would discover significant longevity benefits from taking high amounts of Vitamin C. He stated this belief in his still-authoritative book, How To Live Longer and Feel Better. Pauling wrote that although he couldn’t prove it at the time, he believed that by taking his recommended high anti-oxidant regimen, especially Vitamin C, that humans could extend their period of healthy life, perhaps by 20 or 30 years. As interest grows in the new anti-aging nutrient science and technologies, including and especially telomerase activation medicine, the importance of Vitamin C may be understated. We beg to differ. In our opinion, there is no other nutritional supplement more important for its anti-aging properties. It makes little sense to attempt to extend life while ignoring this easily correctable genetic defect. Any anti-aging and life span extending technology, in our opinion, begins with Vitamin C replacement to account for our damaged GULO gene. Confirmed. There are just under 8 minutes, even on Youtube. Probably has been censored. Will have to look further. Will have to look further. You can also look up Dr. Thomas Levy who has several astonishing videos concerning the success of IVC and liposomal protocols. Anywhere to find the full length video of Linus? It is cutting off around 4 mins and says it runs for nearly an hour? Dawn the video is on youtube and is supposed to run for a little over 52 minutes. You can click on the YouTube icon in the lower right edge and it will open up directly on youtube. I can see the entire thing, so I’m not sure what problem you’re having. Sorry I can’t help more. To know the truth of success in today’s marketplace, the internet is paramount. It’s a crucial tool, really.